RUSSIAN FEDERATION: Recession already over? The Russian economy plunged into a full-blown recession in 2015. Both exports and (even more so) imports were slashed, while the current account surplus surged upwards. The recession may have already bottomed out by mid-2015, yet there is no consensus as to the country’s future prospects. 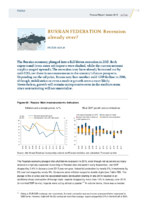 Depending on the oil price, Russia may face another mild GDP decline in 2016, although stabilisation or even a modest growth seems more likely. Nevertheless, growth will remain unimpressive even in the medium term since restructuring will not materialise.